Have the perfect combination of style and functionality at your buffet, party, or catered events with this 6.5 qt. rectangle chafer. Its 201 series, mirror-polished stainless steel is both beautiful and durable, while sturdy, curved legs are included for added allure and stability. Not only does this chafer look great, but it is also highly effective at keeping your hot food at the perfect serving temperature for the duration of your catered event or dinner hours. Also, the roll top lid will hold three positions: closed, 90 degrees, and 180 degrees, for easy use by your staff or guests. Give your customers and guests the dining experience they deserve with this chafer. The stainless steel frame and body not only provides a sleek presentatio,it also gives the chafing dish the strength to last in a commercial setting. The chafer's four broad legs provide balance and help to protect the elevated chafing fuel shelf. 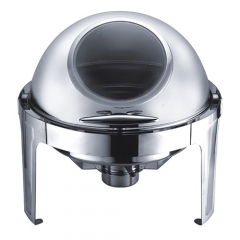 Each chafer features a highly-polished mirror finish that will shimmer in the ambient lighting of your venue.With its high quality finish,this chafer will add to the presentation value of any if the sides that you are serving! The long handle on the top of the lid allows for easy and safe access to the food. It comes with 2 fuel holders that keep hands,clothes and other flammable contents a safe distance from the flame. This kit includes a full size food pan that fit perfectly into the chafer's frame for immediate use. Once your event is over,the pans can be placed on the dishwasher, and the frame can simply be hand washed. 1. Remove all components from the box and unwrap. 2. Place base on firm surface. 4. Set water pan into base and fill with water (fill with hot water for faster heating). 5. Remove the cover from the fuel canister, light the fuel and allow water to heat (steam from the heated water will keep the food hot). 6. Place food in the food pan and set this pan into the water pan. The food pan will be suspended above the water. Place the cover over the food pan. 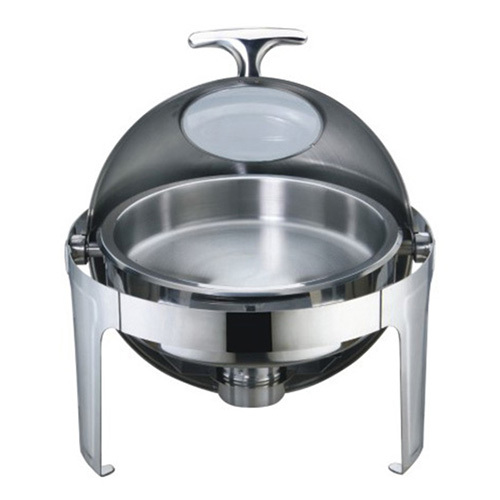 Before returning chafing dish, wash out the food pans. Wash the chafing dish and the food pans in lukewarm water and a mild dish detergent.